Mouthwatering, sweet and tart. These are just some of the experiences you can have at one of the top 10 Delaware candy shops! Whether you are looking to reminisce over vintage candies, try a new flavor, or order hundreds of purple M&M’s for a wedding shower, there is bound to be something perfect for every sugary palate! Here are our favorite candy stores in the state! Originally opened in 1940 as a candy and soda fountain shop, Snyder’s Candy has been in the same location serving the same great sugary treats for over 70 years. The Food Network Magazine picked Snyder’s taffy as “Delaware’s Sweetest Treat” in 2014, and Rachel Ray Everyday picked Snyder’s Taffy as one of “America’s 51 Best Mail-Order Foods” in 2015. You’ll find everything from a collection of kites, to Smiski Japanese Figurines, old-time candy like Chick-O Sticks (a personal favorite) and soda juice wax candies. Though Snyder's may have been around for almost a century, they certainly have kept up with the changing times over the decades. Make sure to add them to your next trip to Rehoboth. The Edie Bees Confection Shop looks like it is straight out of a magazine. Wall to wall confections of every kind from chocolates to sweets adorn the walls of this adorable shop on 2nd Street in Lewes. Glass jars cascade the shelves with a rainbow of delights and the scent of chocolate wafts through the front door as soon as you step inside. Edie Bees isn’t just a place to visit on your vacation, it’s a destination. Awarded “Delaware’s Best” since 2006, Candy for All Occasions is located in the Fairfax Shopping Center and provides every single piece of candy you could desire. Do you need favors for a wedding, shower, or specialty mints for your celebration? Candy for All Occasions provides customized trays for every budget. Each favor is meticulously packaged and competitively priced. Engraved ribbon is added free of charge with each purchase of 25 favors or more. The Govatos family has been perfecting the art of making chocolates since 1894. When you taste these delectable treats, you are tasting more than 100 years of recipe perfection, superior ingredients and family pride. Inside this chocolatey treasure store you can find butter creams, pecan caramel patties, chocolate covered cherries, almond bark, truffles, non pareils, chocolate pretzels and more. Order by the box or hand select your order. Govatos is conveniently located in the Talleyville Shopping Center. Who knew the scent of salted caramel could resonate so deliciously with the smell of the ocean? That’s what you’ll find when you walk through the glass door of Ibach’s on Rehoboth Avenue. Part of the Dolle’s family, Ibach’s is located directly next door to the popcorn giant. Each chocolate and candy is made by hand with all natural ingredients and include chocolate/peanut butter covered pretzels, peanut butter cups, chocolate covered almonds, cashews, clusters, honeycombs and marshmallows, and so much more. Step back in time at Ibach’s and enjoy feeling like a kid picking out your boardwalk treats when you head to the beach. Known for its low prices on food and home supplies, Byler’s is Kent County’s hidden gem for candy, baking supplies, and specialty products. If you want to melt chocolates like a pro Byler’s even sells double boilers to go along with their countless array of chocolate flavored melts. 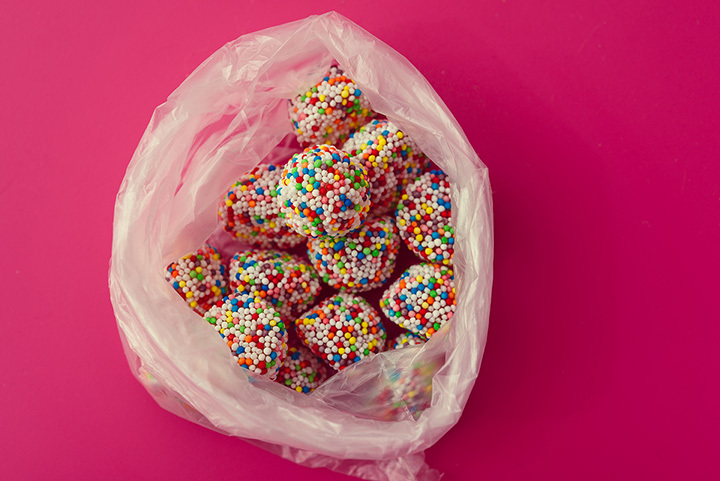 Have a special project you’re working on involving hundreds of gum drops or candies? Byler’s has tons of it in stock at all times. Grab one of their hand dipped ice cream cones while you shop, they are delish! Known as the “Most Unusual Store on the Shore,” the Seaside Country Store holds two floors of variety gifts, home décor, and many, many things to eat. When you walk in to the big red barn in Fenwick Island, you’ll immediately take in the scent of fresh fudge in the kettle as you walk through rows of jams, jellies, seasonings, and sauces. Stop in for some of Rick’s homemade fudge or novelty candy from your childhood. You can even wander upstairs to find beach-fantastic Christmas decorations, gifts, and more candy! A rainbow of colors wash over the walls of every Candy Kitchen, but the location in Fenwick Island is the most popular of them all. Just when you think you have tried every candy or chocolate known to mankind, you will definitely find something new (or old) at Candy Kitchen. They even stock plush based on candy! Test the sugary waters with a few samples and stock up on gifts for back home at Candy Kitchen, where everyone will find a flavor they like.